This beautifully furnished house - a national monument from 1750 - is located in the middle of the small village of Goedereede, on the island Goeree-Overflakkee. It has the smallest facade of the village, but it's fully equipped and because of its depth still spacious enough. It's situated at the harbour and has a pleasant private terrace in front of the door; a great spot to enjoy a cup of coffee. The house is part of the beautiful old city centre, together with pleasant cafes, restaurants and shops. The beach of Ouddorp is close to Goedereede. There you can enjoy kilometres of sandy beach and relax; or you can engage in nice activities, for example kite surfing, diving, fishing or sailing. Visit the seal shelter in Stellendam or the more than 600 goats at the Mekkerstee in Ouddorp. Go shopping in the nice shopping streets of Ouddorp or Middelharnis, visit several museums or enjoy the view from the tower of Goedereede. Goedereede is also the ideal base for a day trip to Rotterdam, Middelburg or Zierikzee; please see the owner's tips for more holiday ideas. Goeree-Overflakkee is surrounded by the water of the North Sea, the Grevelingen lake, the Krammer-Volkerak and the Haringvliet, and has the look of a caleidoscope of landscapes: polders, dunes, salt marshes, meadows and sandbanks. At the Grevelingendam and the Brouwersdam you can recreate in peace: swimming, (kite)surfing, diving, fishing, sailing, blokarting (beach sailing) and powerkiting, it’s all possible. 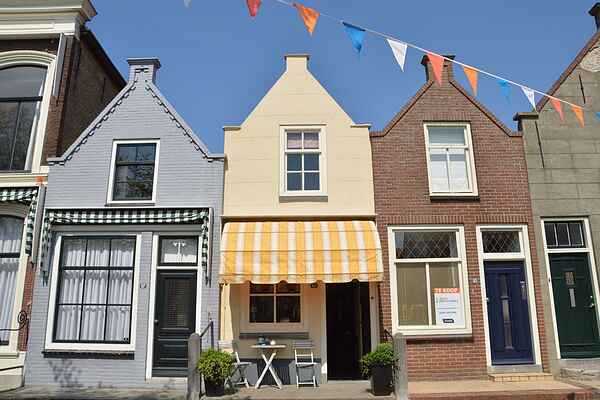 In Ouddorp and Middelharnis you can go shopping in the enjoyable shopping streets. You can walk, hike and bike through the broad dunes and the long sandy beaches, but also visit the nice and quiet nature reservates and wide polders on the island. So many kilometers of beach, great facilities, and free parking near alle beaches of the North Sea in Ouddorp. (Too) busy on a nice (summer) day ? Go to a random beach entrance, walk five minutes to the left or the right and you have the beach all for yourself, it’s amazing ! From the harbours in the neighbourhood of Goedereede, the Grevelingen, het Haringvliet as well as the Northsea can be reached. Hire a boat, or even take your own boat or catamaran with you. We would be glad to help you with finding a good berth ! The bicycle lane network on Goeree-Overflakkee is almost endless; a sign posted netwerk 'Van de Punt naar de Plaet'. The routes bring you along carefully selected bicycle lanes, as beautiful and extensive you will find nowhere else. Cycling along ancient dykes, old mills and bueatiful beaches. Lac du Sud dates from around 1750 is the perfect basis for several activities, in the direct surroundings there is a lot to see and explore! Restaurants, a supermarket and an warm bakery dating from 1872 are at 2 minutes walking distance from you holiday home. Enjoy a guided tour and hear all abount the ancient history of Goedereede, visit corn mill De Windvang. Besides there are several small cities on Goeree-Overflakkee which are worth a visit, like Ouddorp, Stellendam, Middelharnis en Sommelsdijk. or - if the weather turns out not as good as you hoped for - : Subtropic Swimming Paradise 't Zuiderdiep in Stellendam. Also on the other islands like Schouwen-Duiveland and Voorne-Putten there is enough to see, for example the fortified cities Brielle and Hellevoetsluis. Ouddorp: Ring (Boompjes, Hoenderdijk, Weststraat) Day: Tuesday from 8.30 until 14.00 hrs. Goedereede: Noordzijde Haven Day: Thursday from 9:00 until 13:00 hrs. Sommelsdijk : Voorstraat Day: Wednesday from 8.00 until 15.00 hrs. Oude Tonge: Kaaiplein Day: Friday from 8.00 until 12.00 hrs.